What’s In Your Goal Setting Tool Box? Goal setting can be thought of like setting up a “tool box for success.” In this toolbox we add goals for ourselves, rather than resolutions. This tool box is then utilized, to assist in achieving our goals. Goals differ from resolutions, which many people “resolve” to do, but often find difficult to complete or follow through on for any length of time. An example of setting a goal: I will begin walking two miles, four days a week, beginning this Sunday. Verses a similar set, resolution: I want (resolve) to start walking to improve my health. Both appear similar, but a goal has an intended purpose, a concrete objective with a measurable end result, to be achieved within a determined time frame. A resolution is a bit more vague, often nothing more than a decision to do something. 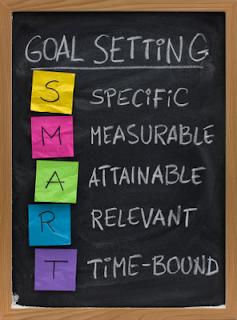 Goals are memorable, achievable and encompass important aspects of your life. By their very nature, goals tend to be positive and achievement oriented. To assist in making them more actionable, it helps to write each goal down and the benefit you’ll derive from reaching that goal. Keep your written goals in a visible place, as a constant reminder of what you are working toward. In order to maximize our goal getting, we also need in our “toolbox for success,” a healthy mind and body for maximum performance. All aspects of our lives must be attended to and considered when planning and setting goals. Take time to select at least one goal for your body, mind, spirit, finances and social life. If you are so compelled, share your goals with others for extra support. Of course, don’t overwhelm yourself with all of these at once, but have a plan set for all aspects of your life. Our toolbox needs more than just one type of goal in order to be well working for success. It’s also important to avoid focusing on any negatives. Instead, put your energy and emphasis on the positive instead. Like attracts like, thus positive attracts positive. By adding these goal setting steps into your life, you will be adding to your “toolbox for success” and they will build upon each other while you fill your toolbox with positive reinforcement and tools to assist you in reaching them. People in your life will most often be willing to help you reach your goals, once they know about them. So, share away! Remember to reward yourself for the small stepping stones of success along the way. Each goal should consist of smaller steps significant enough to gain recognition, while remaining within reach for the allotted time set to achieve them. By filling your “toolbox for success” with goals instead of resolutions, you will be able to transform your wishes into reality one step at a time.